Editor’s Note: This follow up survey to the annual industry trends survey looks at topics related to operations and infrastructure, such as dockage offerings and contract terms and lengths; employee training; dredging and natural disasters; and amenity infrastructure and renovations. Fig. 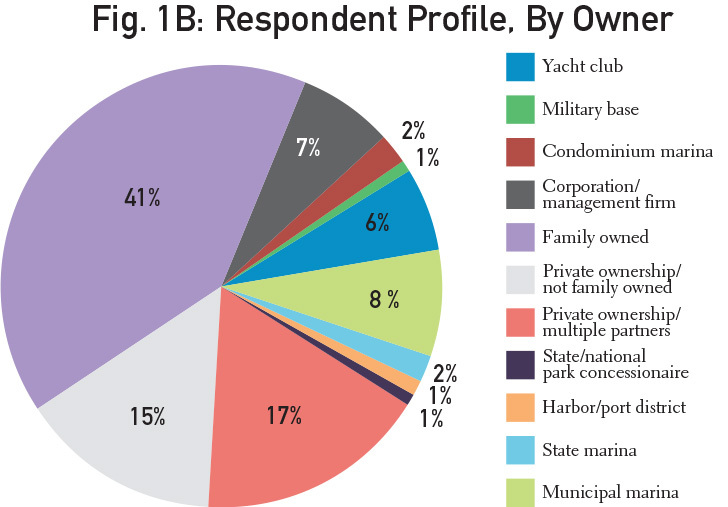 1A identifies the respondent profile by facility type, and Fig. 1B identifies facilities by ownership. These numbers represent the overall respondents for the survey. fields than private or corporate owned facilities and less dry storage overall. Fig. 3 reflects the various types of dockage terms that marinas offer. The largest majority of facilities provide transient dockage. A large number also offer seasonal and annual dockage terms. Those number are also fairly consistent by type of ownership. the majority of private and family owned facilities charge by slip size. for boats up to 65 feet and more family owned facilities cater to boats up to 40 feet. Fig. 6 shows how often marinas dredged at their facilities. Close to half (44%) do not need to dredge at all. About 16% of facilities have dredged only during renovations or expansions or only as funding permits. 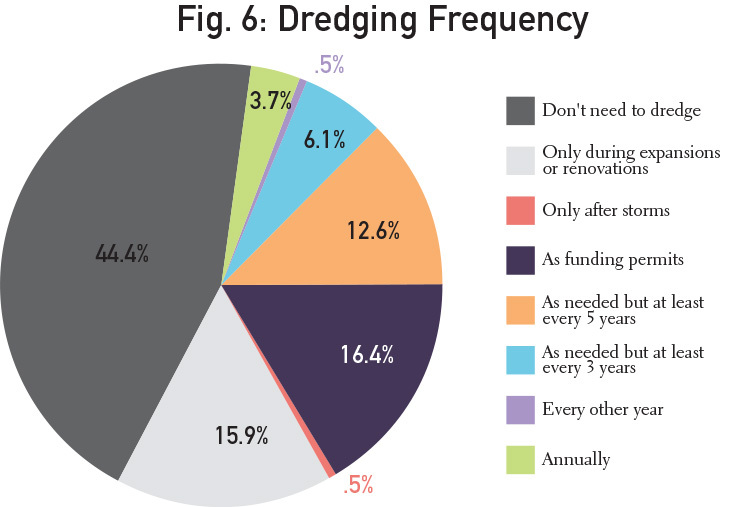 Close to 13% of facilities dredge about every five years. 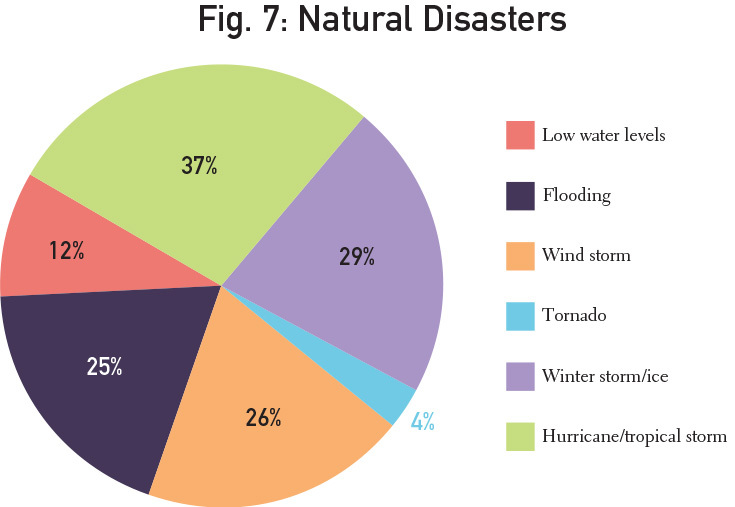 A variety of natural disasters impact marinas, as shown by Fig. 7. The majority of facilities are impacted by hurricanes (37%), followed closely by ice and winter (29%) and wind (26%) storms. 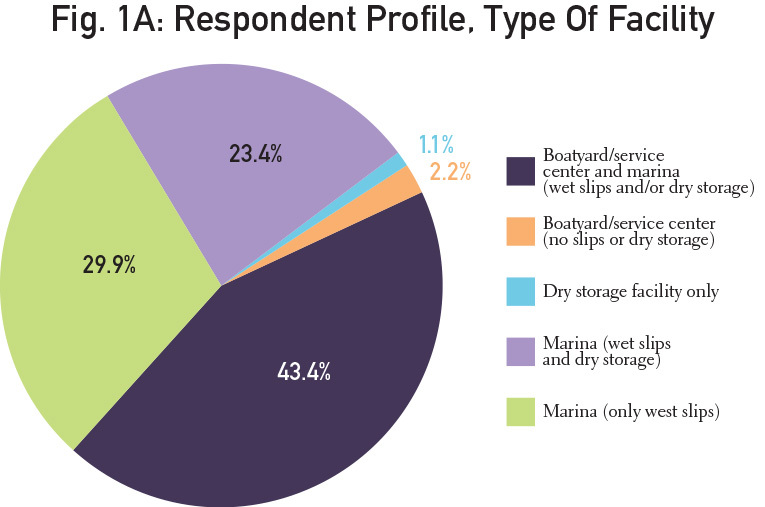 Fig 8 shows the number of facilities that are Clean Marina certified or in the process of certification. 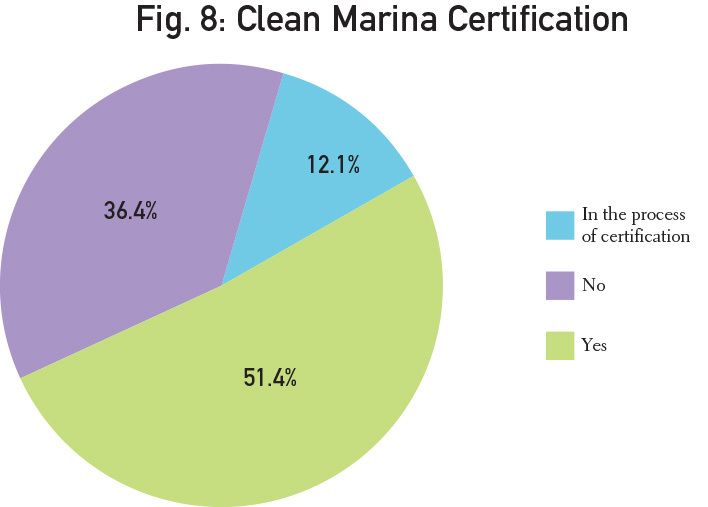 More than half of the respondents (51.4%) indicated that they were Clean Marinas with another 12% in process for certification. 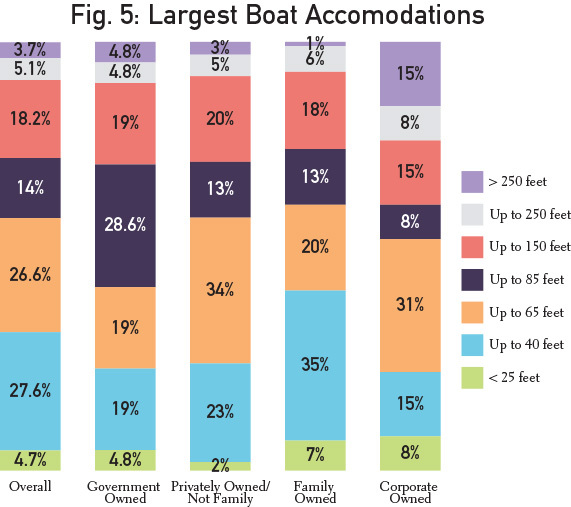 The survey asked marinas to identify what amenities they offered boaters and the age of the infrastructure. Fig. 9A shows only those respondents that identified their infrastructure as original equipment, showing the age of that equipment. The percentage shown after each category indicates what percentage of the respondents did not offer that type of infrastructure. Fig. 9B shows the facilities that identified their infrastructure as not original or renovated and how long ago the infrastructure was renovated. Fig. 10 shows the different types of employee training offered at facilities, the overall number that offer that training and how often the majority of facilities offer that training to employees.